The adjustable height work bench provides an ergonomic work surface that can be set to an optimal level for quick, safe, and productive labor. Benches provide sturdy support for supplies and equipment that require varying degrees of service, labor, and attention. These versatile tables are ideal for any shop or factory where more than one type of item must be attended to and moved out as quickly, efficiently, and as safely as possible. The development of these specialized workbenches arose out of two definite needs. One of these was the demand for a work surface that could accommodate more than one type of item. Some items, such as engines, must be worked on from the top down. Other items, such as small parts that go into various types of assemblies, must be put together from the bottom up. Setting a bench to a height that allows the most accurate and rapid access to tools, equipment, and supplies was the primary advantage this work table brought to shops around the world. There is also an ergonomic benefit to working over an adjustable height work bench. The worker can raise the bench to a level where it is not necessary to bend over to work. This eliminates back and shoulder strain. The economic advantage this creates is obvious. With a lower risk of injury, there is a significant diminishment of liability that results from on-the-job injuries. Workers are also much more motivated to maintain a consistent pace throughout the day when they feel less pain, less strain, and can work with the confidence that an injury is unlikely to occur. Adjustable height work benches feature a very basic design that is adaptable to everything from a small shop, to a warehouse, to a factory. The table consists of a steel frame that houses a tabletop bench. This table is set to a specified height to accommodate different loads and the use of different kinds of tools. Specific features include a drawer attached to the unit that goes under the bench top. This drawer can be secured with a padlock or combination lock. Adjustable legs allow for vertical movement and provide great stability. Bench tops are made from layered particle board that is designed for superior screw retention without splintering. 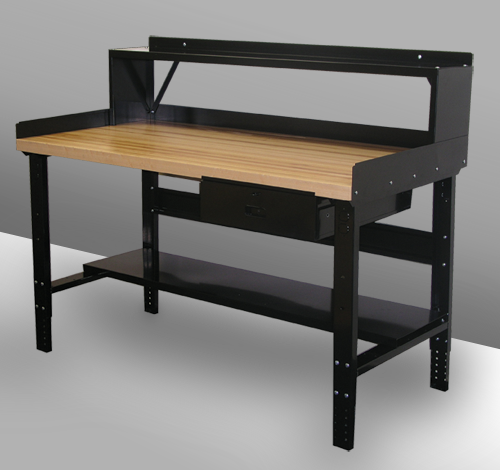 There are adjustable height work benches with laminated hardwood tops and industrial strength steel tops. The work table also has a 10 inch riser that extends upward behind the work bench, along with a lower shelf and a stringer designed to give the entire assembly greater lateral stability. Back and end stops make it easier to hold any number of materials, objects, parts, engines, or loads of any kind securely in position on the work bench. Unit assembly is simple and quick. Organizations can contact XPB Locker for more information about specific applications for which the adjustable heightwork bench is ideally suited. Better safety, better productivity, and more versatility is something that every company, large or small, can count on receiving by investing in these unique and durable workbenches. This article was published on Thursday 12 January, 2012.